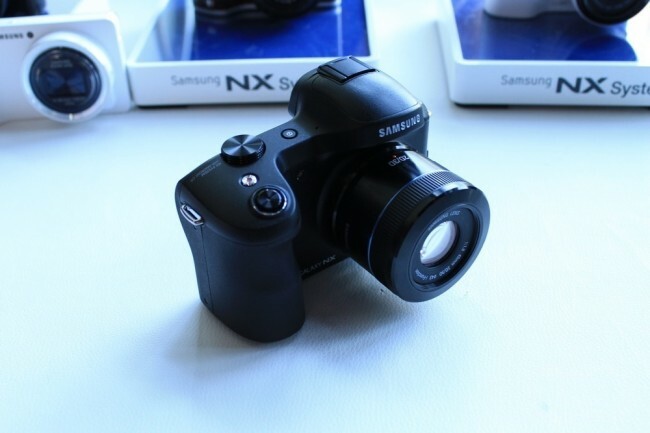 Samsung announced this morning that its Galaxy NX will officially launch in the U.S. during the month of October at a starting price of $1599 (body only). The interchangeable “professional” grade smart-camera that runs Android 4.2, which Samsung is calling the “first connected Compact System Camera,” can also be bundled with a 18-55mm lens for $1699. These prices are for the WiFi model. And no, I’m not making these prices up. For those not familiar, the Galaxy NX offers a 20.3MP APS-C sensor along with a DRIMe IV Image Signal Processor to deliver the “speed and accuracy which today’s photographers demand.” It also has an Advanced Hybrid Auto Focus system, a 1/6000 sec shutter speed and 8.6fps shooting, and a selection of interchangeable lenses from compact pancake to ultra-wide fisheye to longer prime and zoom lenses. As an Android device, it runs Android 4.2 on a 4.8-inch HD LCD display and has access to the Google Play store and all of your favorite apps. The device itself sports a 1.6GHz quad-core processor, 16GB of internal storage, microSD card slot that is expandable up to 64GB, 2GB RAM, and a 4360mAh battery. It also includes all of Samsung’s TouchWiz Smart Modes in the camera, so you are swipes away from filtering the hell out of your $1600 photos.